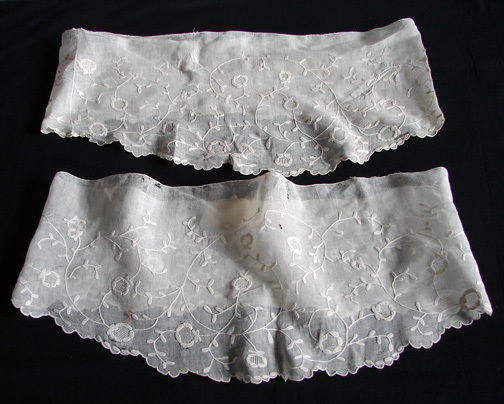 A pair of Dresden sleeve ruffles, embroidered with whitework (see below for image source). The only thing my caraco jacket ensemble needs now is some lawn ruffles. 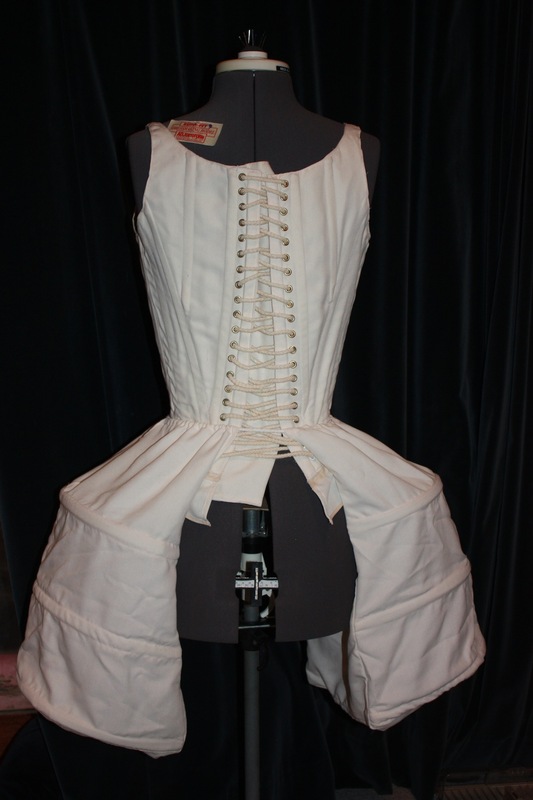 During the eighteenth century, it was common for ladies to tack several layers of white ruffles to the sleeves of their gowns or jackets. 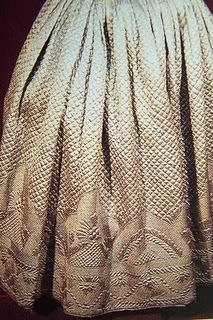 These could be made from lace, such as Mechlin or bobbin lace, or embroidered with whitework on cotton lawn or muslin. 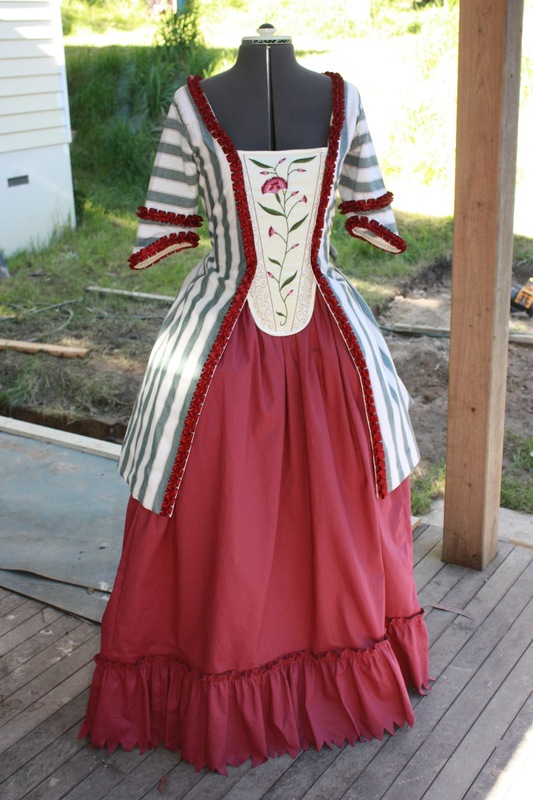 In making this pair of lawn ruffles, I used the pattern from Janet Arnold’s Patterns of Fashion 1 as a guide to the dimensions they should be. 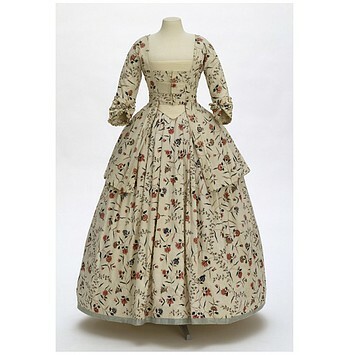 Altogether there were four ruffles, an upper and lower ruffle for each arm. 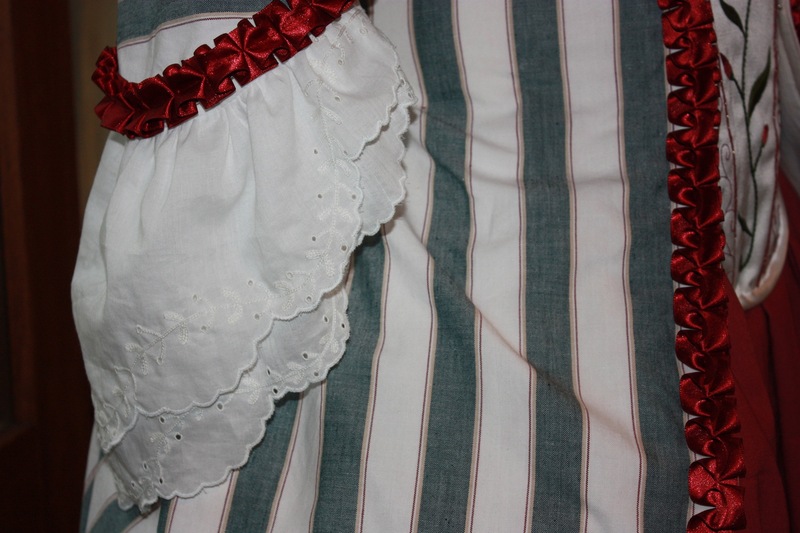 The ruffles are asymmetrical – as was common in the eighteenth century – and were both 13.5 inches wide. 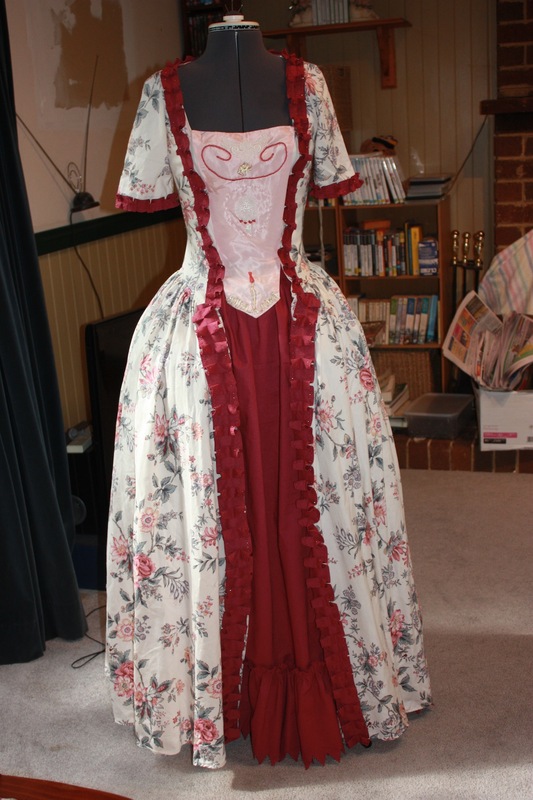 The lower ruffle was 8 inches deep and the upper ruffle was 6.5 inches deep. 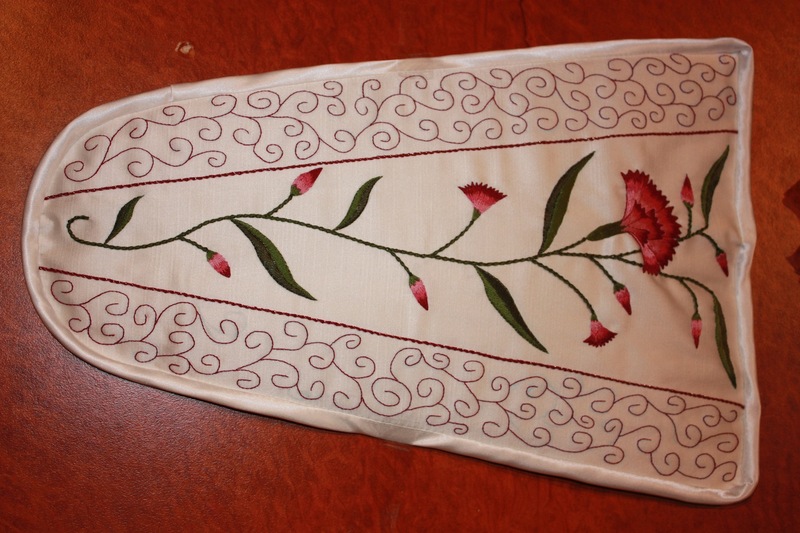 Once I had traced out the pattern on some ivory lawn with tailor’s chalk, I then used a scalloped embroidery stitch on my sewing machine to finish the bottom edge of the ruffle. 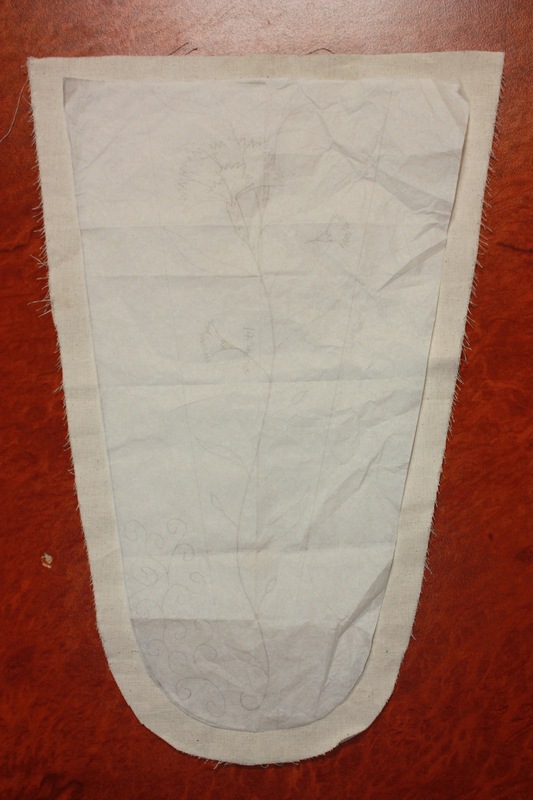 Then I traced a pattern onto the ruffles to embroider with whitework. 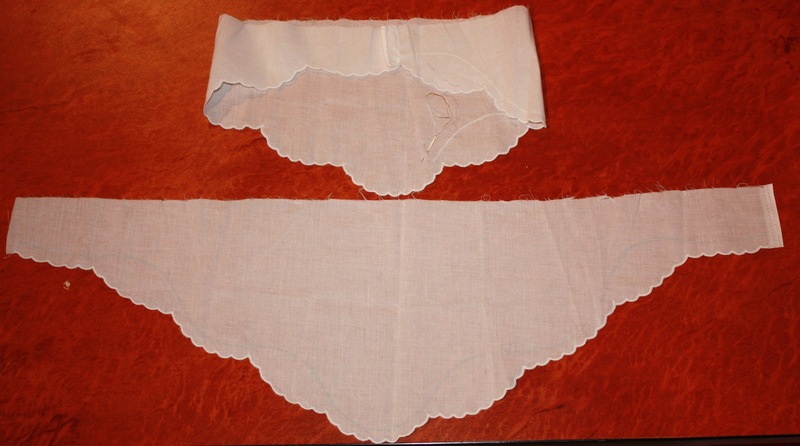 The one at the top is the upper ruffle, and the one at the bottom is the lower ruffle. 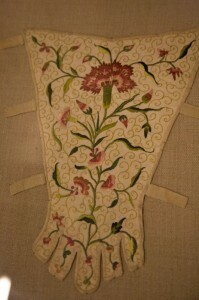 The embroidery consisted of a small chain stitch with eyelets at intervals. 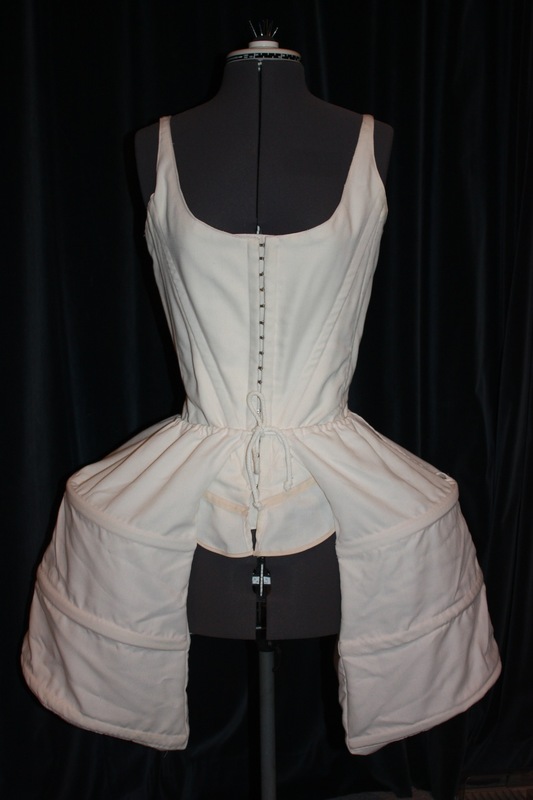 The eyelets were made with an awl and then stitched with an overcast stitch to keep it from closing. 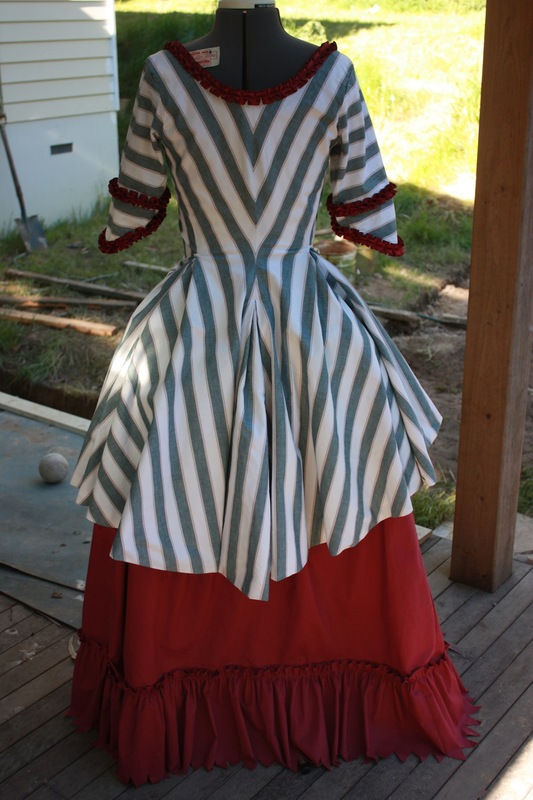 Once the embroidery on each ruffle was completed, I sewed each ruffle seam and gathered each top edge separately. 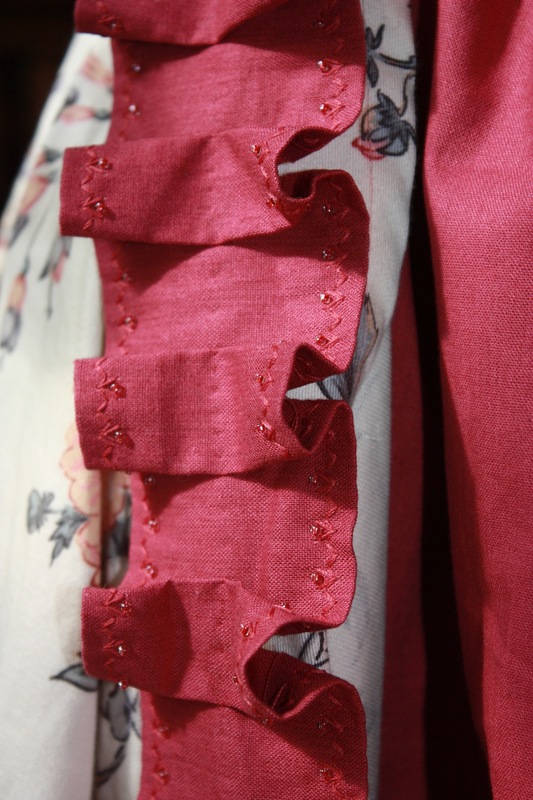 The upper and lower ruffle were placed on top of each other, arranging the scallops so they were lined up evenly, and then they were sewn to a band. This band can now be tacked to any garment and removed for separate cleaning. And the finished product looks like this! I am really pleased with them! I haven’t had enough time to embroider them as much as I had planned to, as I am going to wear them this weekend. However, I would like to come back and try some pulled work on them later. 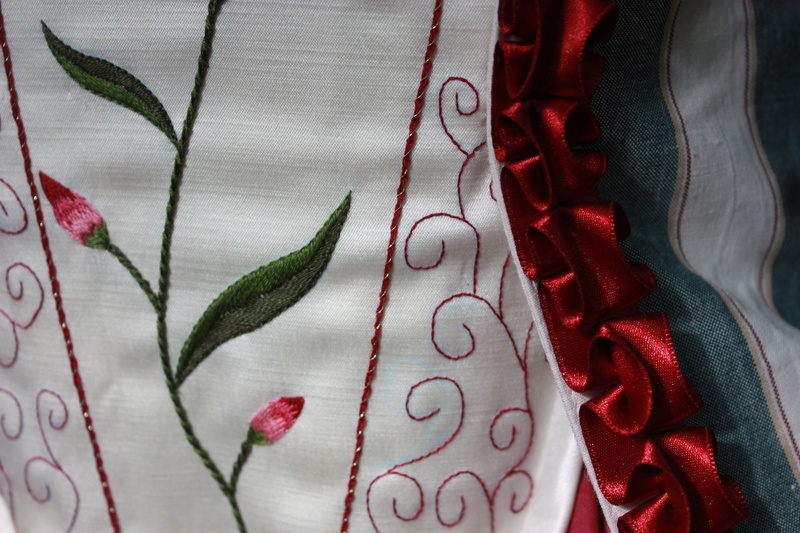 I think pulled work in embroidery is so pretty and effective. It seems to be the closest thing to lace that I could fairly easily make! Embroidery is my cup of tea! 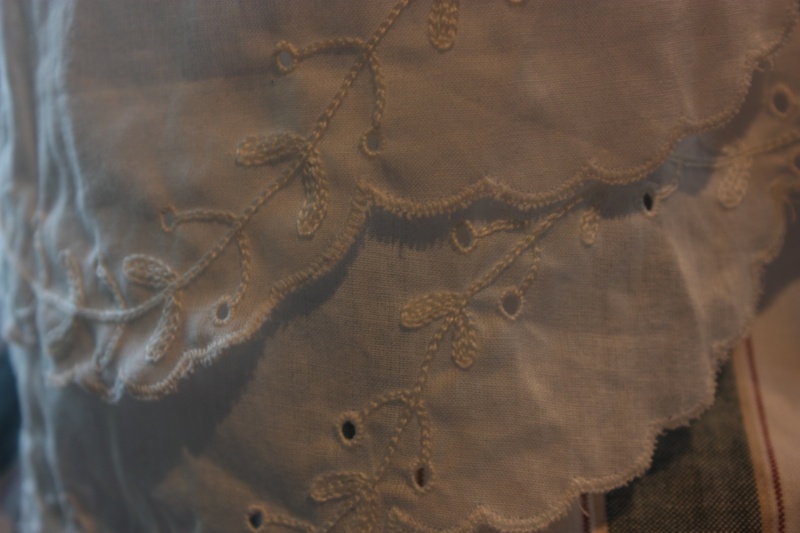 Whitework Sleeve Ruffles – with some background information on sleeve ruffles in the mid-eighteenth century. How Heavy is Too Heavy for a Dress? I found this funny pair of letters in an historical fashion book the other day! The Purefoy Letters No. 447, July 15, 1739. I desire you will send me … fine thick printed cotton enough to make two wrappers for my Mother, they must be of two different handsome patterns. 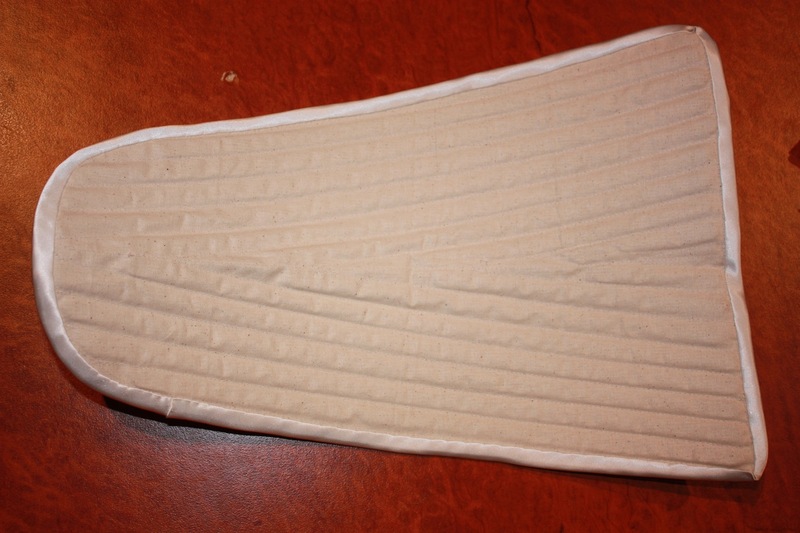 You must also send a neat white quilted calico petticoat for my Mother which must be a yard and four inches long. The Purefoy Letters No. 448, August 5, 1739. 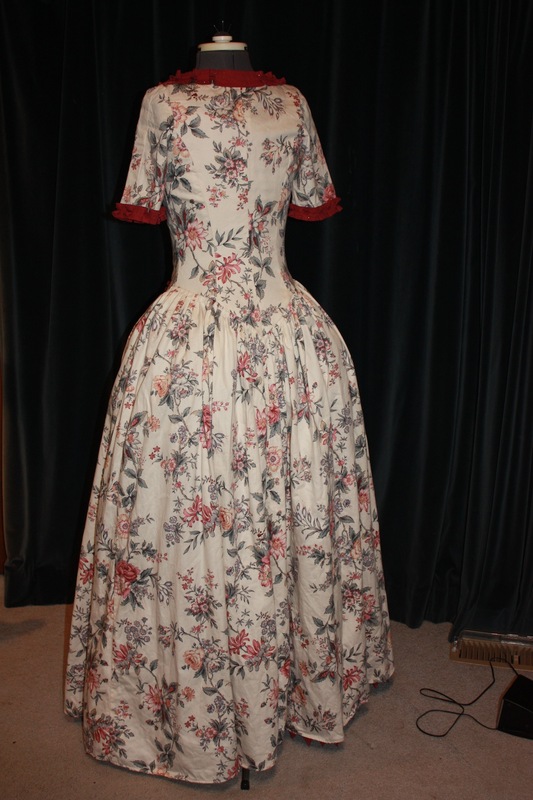 I received all the things in the box and have returned you the Marseilles Quilt petticoat by Mr Eagles, the carrier. It is so heavy my mother cannot wear it. I have yet to discover how heavy this type of garment is! The things we women suffer in the pursuit of fashionable clothes!